Party and Gift Bags - What's inside ? In America they are called loot bags and here they are called party or goodie bags. 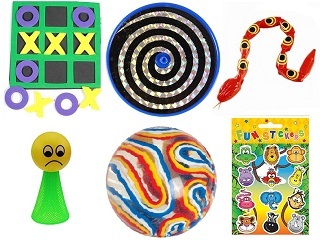 No childrens party is complete without party bags but what should you put in them and more importantly if you bought them ready made up from ourselves what would you be getting for your money ?. Children love some sort of treat to take home with them but you really don't need to splash out the cash if you really don't want to or can't afford to. One way to cut down on the overall cost if you are on a tight budget is to also use a party bag to include a piece of Birthday cake. You don't even need to go out and buy expensive bags as a plain coloured paper bag will do just as well. 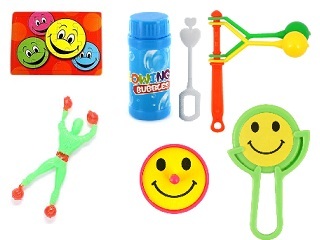 Party bag fillers are readily available from many shops. A trip to your local pound shop might find suitable gifts for them but the cost soon mounts up especially if you are going to be having a large party plus what do you do with all the extra items left over and also the choice of items is very limited. Another idea for you, instead of party bags for your son or daughter's Birthday Party is to simply buy one of the large colouring packages that you can buy from many shops to give the children as a thank you for coming to the party. We also supply gift bags for weddings to make your day extra special for the children. You could go round all the shops looking for suitable items, however, after you have spent a long time at the shops finding suitable gifts for them you will always find that you have some over or worse still, not enough. Don't forget to add the hidden costs such as petrol and parking that went into your purchases and you will soon see that what you thought was going to be only a cheap add on, soon adds up, especially when you multiply the one bag by the number of children you are expecting. This is where we can help you out, so let us provide them for you. As a party organiser we can make up party / goodie bags for you no matter how big or small the event. These are brought along on the day and are suitable for both boys and girls. No more running around shops and having to spend hours putting them all together only to have a load of things over. Whatever you decide, remember to always keep within your budget. 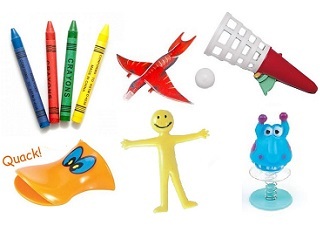 We have included some samples on this page to show you some of the things that we supply for them. 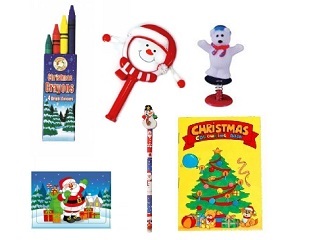 Christmas is a busy time for us and , yes, we can also supply party bags for a Christmas Party. 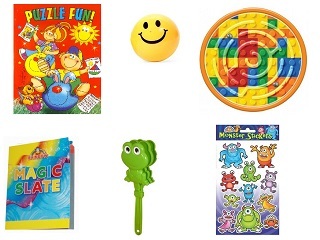 To order party bags please email us or include details on the booking form with your required quantity for boys and girls and we will fill them with items suitable for the age range of the party / event. We can cater for a small house party up to a large event. We can even supply these for Christmas parties. Party bags can be ordered at anytime up until the day before the party or event. If you do leave it last minute then a phone call to order them is best. 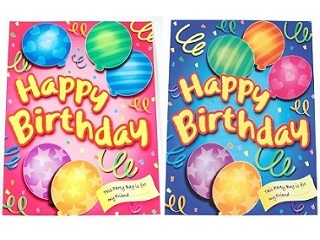 Our supersized Birthday Party bags are much larger than the shop ones available, measuring 22 X 32 cm approx. ( slightly larger than an A4 piece of paper ). 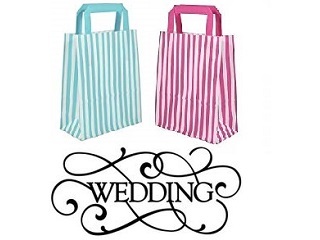 Our wedding gift bags are super colourful striped ones and our Christmas party bags are Christmas themed. Always order extra party bags than what you think you may need as you only pay for the ones required and the others we simply take back with us.